As most of you know, the Hitmen travel to Florida every year for Spring training: the JV goes during Presidents’ week and the Varsity during the Easter/Passover break. This year almost the entire JV team went down for a week full of instruction and inter-squad games. The JV also had a chance to visit the Mets’ spring training facility and get autographs and pictures with the Mets. This is such a crucial week for the younger players because many come to us with tools but not a great knowledge of the game. During that week, we instruct the players on the proper way to play baseball and teach our “Hitmen” philosophy, which is hard work and dedication. The JV team has a surprisingly strong freshman class, complimented by some veteran presence. Our pitching depth is tremendous and we have played good defense so far, with our bats really coming alive as of late. We are 2-0 in league play and are excited to get our PSAL league games in. The varsity trip was just as successful. We posted a record of 3-4, which doesn’t sound great but we did face teams that use metal bats compared to our wood bats. This year the Hitmen got a treat by playing one of our games at Vero Beach’s famous Dodgertown, which we won against a Western New York high school. This was one of our best trips ever in the 10 years the Hitmen have been going to Florida. The boys all acted in a mature matter and worked very hard to improve their baseball skills. We just wanted to thank the “Seniors” for making this a memorable trip; they will be truly missed next year. We would also like to thank the FSB board for arranging all the events this year and supporting the Hitmen in every way possible. Without the continued support of FSB and generous alumni donations, we would not have such a successful program at Stuyvesant. This year, donations funded new equipment; access to off-season indoor training facilities; and “Florida scholarships” for players who would be otherwise unable to attend our Florida spring training programs. 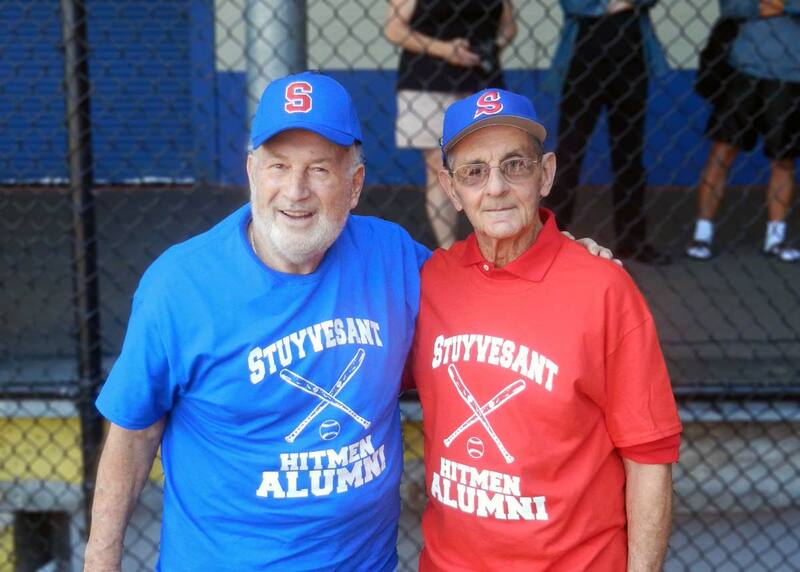 Donald Ferrara ('56) and Joe Levine ('54) ready to throw out the first pitch. A good time was had by all. Thanks to everyone who came out and helped, contributed, played or just hung out and enjoyed the day. I am sorry this took so long but it has been a crazy week for me. I just wanted to say thank you to everyone who participated in the Alumni game last Saturday. I have gotten numerous emails and calls from players thanking us for such a great event, without the FSB this would not have happened. The look on some of the old-timers faces was priceless; it was great watching them warm up and take the field; many could not believe that we have our own field now. They would share stories with me on how difficult it was to get to a field and practice and never knowing if a homeless person has set up temporary housing at home plate on the East River fields back in the 70’s and 80’s. 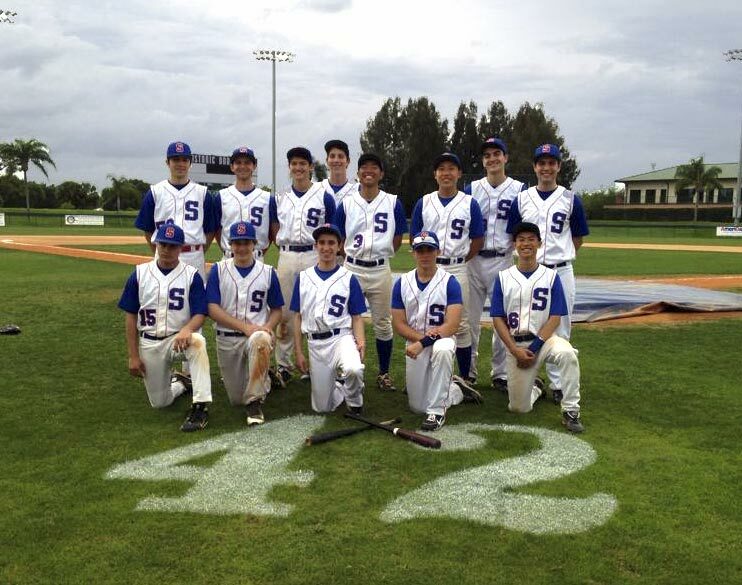 Thanks to Lee Mandell (P '14) for the picture and video.